well, i tried to find in search a thread stated by gris on blow molds and couldn't, so i will post one. hope i'm not doing a repeat. and i can't wait to see what gris and putrid post. i went to goodwill yesterday, and for $10.00 got 3 wisemen, mary, and joseph. so i already displayed them outside. Last edited by halorene; 11-26-2011, 03:26 AM. WOW what a score Halorene and the price! Great Score Halo! 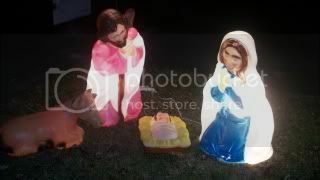 I love that set I use that one myself as the Mary and Joseph were my families original blow mold set. It looks like the Wisemen are wearing their jewels on their hands so they must be older. Are they made by Empire (Carolina Enterprises)? Did they come with Jesus? If not you can always swaddle a doll and add it to the scene. they didn't come with jesus. but about a month ago i spotted a baby jesus at the same goodwill. i grabbed it just because i recognized it was a blow mold. if i can find it i will use it. then again it might go with this set and somehow got separated. when i saw this set at goodwill, my heart thumped, and i had no money. i started hauling it as fast as i could up to the checkout 2 pieces and then 3 pieces. then i asked them if they would hold it till i came right back with money. i ran and got my daughter and borrowed the money. she came back with me, and seeing what they were [she collects nativity sets], said she could only handle it because they were blow molds. but she was jealous. then a lady got in line behind me while i was paying, and she had a blow mold in her basket. i said to my daughter, how'd i miss that. we decided they must have put it out while i was gone getting money. dang. lol. i'll be putting out another nativity set from a garage sale my daughter and i were at together a couple of years ago. i saw she saw them and was surprised she didn't try to buy them. there was no price so i asked the lady how much, she said...what will you give. i said...$2.00. she said fine. my daughter was freaked. lol. i asked her why she didn't go for them, i thought maybe because they were blow molds. she said she thought they were more than she could afford. well, she is always making comments on how cheesy blow molds are, so i won't share. i remember the one year as she was saying how cheesy my halloween ones looked she got over ruled by her 2 little ones who were standing with great admiration on their faces and little fingers pointing and one word from each....PRETTY. i loved it. oh, gris, that is so cool you still have your family one. that's a real true treasure. People really act weird at Christmas time. After all, what other time of year do you sit in front of a dead tree in the living room and eat nuts and sweets out of your socks? Wow great story Halo my heart would have been pumping as well as I rushed to get the cash. Just curious what one got away from you in the other ladies cart? it was a smaller version of those big candles. Totally cool score Halorene! That's a really nice looking set. There is beauty in a winter's full moon. Glittering off the snow between the shadows of barren branches. That is a super deal! I love that set as well, and tell your daughter she is right, blowmolds are cheesy, that is part of their charm! Kids get such a big kick out of them just as we do, they keep us young at heart! You can visit my home holiday displays on Facebook at Blowmold Magic Holiday Displays. thanks everyone, and hermey, i will tell my daughter that. Great score Halorene! I too am on the look out for a Nativity set. Hope I find a deal like you got! Very nice find. Best part is they were almost "free". Please stop by Facebook or our website for a visit. here's a picture of another nativity set i purchased for $2.00 at a garage sale. it came with the box. you can never get them back in the box as they were when you bought them. i hate that. the cow is a purchase i made later on in this thread. i updated this photo so the cow is ahead in this purchase. 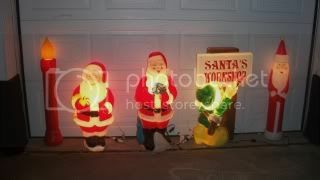 and here are 3 santas, and a santa sign, and a candle i've hauled up from the basement so far. i also brought up my winnie the pooh, but i see it is missing the light. this isn't one of those clip in lights, it's one of those lights that has a bulb and bracket that slip into a screw in plastic piece. i just need the bulb and slip bracket. any ideas where you get one of those? Last edited by halorene; 01-21-2012, 09:43 AM. There are currently 1031 users online. 2 members and 1029 guests. Most users ever online was 3,474 at 09:13 PM on 11-26-2017.